During his 2013/14 Presidential year, then Rotary Club of Eltham President Ken Paynter had a priority to address male mental health issues in the Eltham area. Ken had become aware of the need for the men of the Eltham area to have a means of socialising and sharing their trials and tribulations with cohorts of like and varied minds. He saw the establishment of an Eltham Mens Shed as the perfect conduit for satisfying this need. In November 2013 a public meeting was facilitated by the Rotary Club of Eltham to gauge the extent of interest by Elthamites in establishing a local Mens Shed. Not surprisingly the meeting was very well attended by both men and a few women (obviously keen to get their men out of the house). Out of this meeting a willing Steering Committee was established. Even though the group didn’t immediately have a traditional Mens Shed “home” with guidance from the Australian Mens Shed Association and tapping into the Rotary Club of Eltham local community network, a process began to bring a Mens Shed to fruition. The process included the provision of support, advice and seed funding by the Rotary Club of Eltham, the Nillumbik Shire Council and a Rotary District 9790 Grant. Thanks to the generosity of the then Melbourne City Mission, the group took up residence in early 2014 in a small former manager’s residence in the Misson owned Eltham Judge Book Memorial Village. 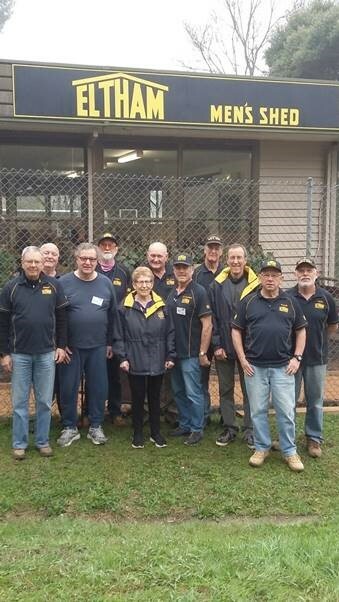 In August 2014 the Eltham Mens Shed (EMS) was incorporated with 18 foundation members. Whilst limited in the nature and scope of activities it could offer to potential members, the commitment and enthusiasm of the founding committee and members confirmed that there was a need and place for such a group in the area. In July 2015 St Vincents Care Services assumed ownership of the Judge Book facility and graciously continued the commitment to allow the EMS to occupy premises on their site. Since 2014 the EMS membership has grown to 62 as news of the obvious ‘bon homme’ traits and social/ mental health benefits spread through the community. While only limited activities continued at the St Vincents Care site, the members have been active in developing special interest groups, interacting with the local community on projects and fund raising in anticipation of eventually obtaining their own premises.On 12 April 2018 the vision of PP Ken Paynter and the dreams of the EMS members were fulfilled when long- time supporter Nillumbik Shire Council allocated former kindergarten premises in Wattletree Rd, Eltham to the group. Utilising self-raised funds and a long established Victorian Government Mens Shed Program grant of $60,000, the group is in the process of transforming the Wattletree Rd buildings /site into a “real Mens Shed”. Communal meeting/social areas of the building will be made available for use by other community groups. Additional public/private funding will be sought to facilitate the construction of a workshop. Over the past 5 years the Rotary Club of Eltham in conjunction with Council has continued to liaise, advise and support the development and activities of the EMS. This support will continue! The establishment of the EMS will bear long lasting testament to the contribution which Rotary can make to local communities.